Hospitality and Event Management is a two year program designed to prepare students to enter the world of event planning and hospitality management. Students will develop skills in the fundamentals of the hospitality field, event and food planning, and management and operations. In a unique partnership with the SWCA Culinary Arts program, students will learn to organize and plan meetings and events, in addition to lab experiences focusing on the the day to day operations and management found in the hospitality industry. Students will hone their skills in customer service, analyze risks and develop strategies for event management. Students will develop management skills and learn how to run the front office operations of the lodging, culinary, hospital and large business industries. 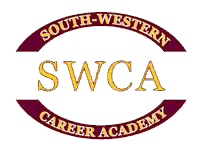 Student will earn hands-on experience by managing and facilitating clients through the Academy Meeting Space located in the South-Western Career Academy. The Academy Meeting Space is a conference area completely furnished with the latest technology that outside community members can reserve through the program. Reservations can come as a catered event by the Culinary Arts program. For more information please email swcaevent@gmail.com. Teamwork, problem solving, and collaboration are essential skills that will be developed over the course of the program. With opportunities to mentor and intern with business partners throughout the area, students will be able to get a real-world experience. Participation in the national technical organization SkillsUSA. ​Students will manage and facilitate the Academy Meeting Space. Early job placement opportunity during second semester of senior year. On-Site professional experiences through mentoring opportunities. Activities are both individual and team project-oriented. Columbus State Community College allows up to 6 selected credits earned in this program at SWCA to be transferable to the college and applied toward a degree. The number of college credits are subject to change. Below is a Halloween Event organized and hosted by the Hospitality and Event Management program working in conjunction with the Culinary Arts program.